The small desert town of Granton is a typical slow boiling pot of unfulfilled hopes and dreams. Every hard working day is much like any other here where little ever changes. Sheriff Cassie Wheeler runs a right ship in the tradition of her late father. There is little serious crime to trouble her department, save for the local miners' occasional rowdiness after payday. But Granton has its share of secrets hiding behind twitching curtains. Small town folds often have the biggest of ambitions. Now the long dusty road into town has brought with it a stranger. A man of elegance calling himself Gilbert Grange has arrived. he brings with him a bag full of dreams and a silver tongue or promise. he can give you whatever you desire, all you to do is sign on the dotted line. The residents of Granton are about to discover that dreams can come true at a terrible price, and you should always be careful what you wish for. 1. 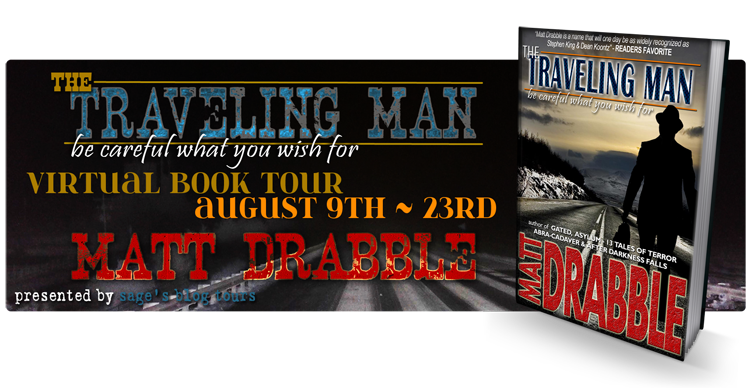 For anyone who hasn't read The Traveling Man, why would you (the author) recommend it? 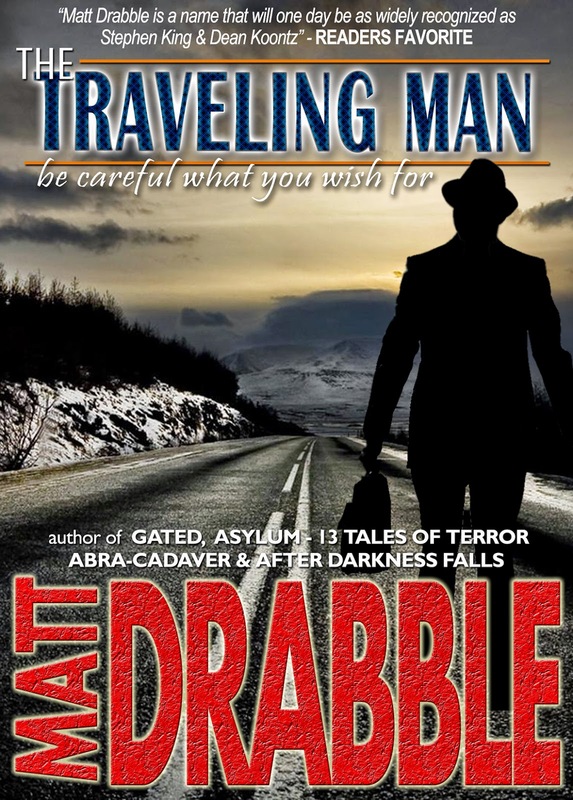 "The Traveling Man" is a horror/thriller that is character led with enough thrills, scares and pace to ensure an enjoyable ride. 2. When you were little, did you ever imagine becoming an author? Honestly no. I have always loved books and reading, and I do subscribe to the old adage that everyone has a book in them, it's just getting it out and onto the page that's the difficult part. Most of the writing that I originally did was only really for my own enjoyment, the concept of another person ever reading my work never really occurred to me, I still find it difficult to comprehend whenever I read a review. 3. As a writer, do you have a specific genre that you prefer to stick to when writing? I would say horror, but I do believe that it is a rather more broad genre than people generally give it credit for. I think that my work does veer into a supernatural thriller vibe, I believe in character led stories with a twist in the tail. 4. Read, read, read. Write, write, write. That's the kind of advice most authors give to aspiring writers, but what would you recommend to those who yearn to succeed? There is no shortcut to experience, the only way that you'll learn and improve is to write and write a lot. Proofing is always a problem when operating at a self-published level. You won't have the budget to spend on professional proof readers so read everything carefully, also get as many pairs of eyes on your work as possible. I find that putting your first draft away for a couple of weeks will give you the chance to gain a little distance before your review. One of the most important things for a new writer to gain is to grow a very thick skin. To begin with you will operate with a scattergun approach when it comes to attracting readers, some will like what you do and some won't no matter what you do. Hopefully as you progress you will start to have repeat readers who are more inclined to enjoy your work. Remember if you start chasing everyone's approval you'll never stop running. 5. Do you ever base your characters off of people that are vital in your life (ex/ family members, friends, fellow authors)? I have to be honest my life is pretty solitary, writing full time can be a pretty lonely existence if you don't enjoy your own company. Also people will always be able to read themselves in your work and when writing in my genre that wouldn't necessarily be a good thing! 6. In your opinion, to be an author what are three characteristics you must have? Determination, Communication, A thick skin. From an early age reading so many words of varied authors, I took the somewhat foolhardy decision to attempt my own novel. I now have eight novels available, "Asylum - 13 Tales of Terror", "Gated" , "Rapture Falls", "Fangsters" and my latest novels "Abra-Cadaver" & a new horror anthology "After Darkness Falls" Volumes One and Two. I have also just published a sequel to "Gated" called "Gated II: Ravenhill Academy". "Gated" was a UK Horror Chart #4 best seller. "Asylum - 13 Tales of Terror" was a Horror/Anthology Chart #1 for over a year and voted #5 on The Horror Novel Reviews Top 10 Books of 2013. "Abra-Cadaver" recently won an Indie Book of the Day award. I have recently been signed by Taylor Street Books in San Francisco who will be producing my novel "The Montague Portrait" and I am currently writing "Double Visions"